Why I'm Competing With You. And You. And You. And You. Social media changes the very fabric of corporate competition. It used to be that your competitors were the people that sold similar goods and services, or operated in the same geographical area. No more. Now, you’re competing with Coke. With McDonald’s. With Chevy. And Zappos. And Jet Blue. And every other company on the planet. This is because consumer interactions with companies are jumbled together like a real-time gumbo. Your status update is located in-between updates from other company’s “liked” by that consumer – not to mention updates from friends and family. The same is true on Twitter, where your tweets are sandwiched between Bieber musings, Breaking News, and God knows what else. The email inbox is also a battleground, with your special offer competing through the attention aperture (as Brian Solis calls it) with Nigerian Prince scams, Amazon recommendations, and Linkedin “don’t forget to connect with this guy” nudges. The reality is that the social and email behaviors, restraint, and adherence (or lack thereof) to best practices on the part of EVERY OTHER COMPANY IN THE WORLD impacts YOUR success. This concept was brought into sharp focus for me recently by the new “Social Break-Up” research from ExactTarget and CoTweet (clients) that examined why consumer stop engaging with brands in email, Facebook, and Twitter. Wow. 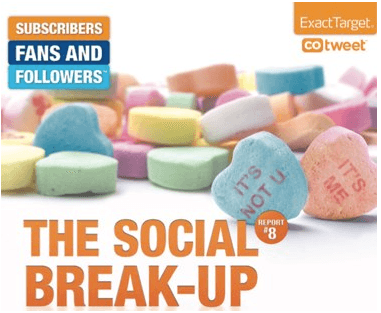 Regardless of platform, receiving too many messages from too many marketers is a very likely cause of subsequent break-ups, throwing dead weight over the side of the social and email ship until it floats again. Consequently, if all the other companies that the consumer follows are seduced by the siren song of oversending and overcasting, it has a material impact on my success. Consumers only have so much attention to spare. After all, they have jobs to do and families to raise and dinner to cook and T-ball to coach and watercolors to paint – just like us marketers. So let’s think about whether that next email, tweet, or status update is really growing your relationship with your customer, or is just pointless and banal, clogging up the stream and chucking the rest of us under the bus. For all of our sakes, will you give it a try?